With less than six months to go until Norway's general election, increasing tensions over immigration and Islam appear likely to play a significant role in the vote. The leader of the country's main opposition party has warned that it is facing "sneak-Islamisation", while some prominent Muslims say they face growing "persecution". The heated debate is a sign that Norway, renowned as one of the most peaceful and tolerant nations in the world, is facing the same issues with its Muslim minority as are now familiar in other parts of Europe. 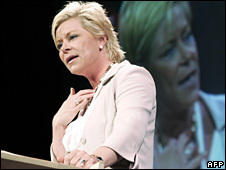 Siv Jensen, the 39-year-old leader of the opposition Progress Party, has objected to moves to introduce special measures in order to accommodate Muslims' religious sensitivities, traditions and rules. "The reality is that a kind of sneak-Islamisation of this society is being allowed," she recently told a Progress Party conference. "We are going to have to stop this." Opinion polls suggest the party could win as much as 30% of the vote in the election for the national parliament, the Storting, in September. "If the Progress Party gets to govern Norway, we will enforce Norwegian law and Norwegian rules. We are not going to allow special demands from any single group in society," Ms Jensen added. Khalid Mahmood, a Pakistani-born member of the governing Labour Party believes Muslims are being persecuted, and Islam confronted with hatred. "Muslims are the Jews of our times, stigmatised, generalised and presented as a threat to society" he says. "It is not any longer immigrants who are targeted, but simply Muslims", he adds. "We are portrayed as uncivilised people living double lives - orderly and behaved when in public, but at home fundamentalists suppressing and physically abusing women." Last month, the European Commission against Racism and Intolerance (ECRI), the racism watchdog of the Council of Europe, published a report warning that Islamophobia was on the rise in Norway. Specifically, the commissioned highlighted the increasingly aggressive rhetoric of the Progress Party. With an estimated 150,000 of Norway's almost five million population being Muslims, Islam is the second-biggest religion in the country. But while Norway was ranked the most peaceful country in the world by the World Peace Index in 2007, it is struggling to integrate its religious minorities. In some places, Islamic traditions clash with the largely non-religious Scandinavian way of life. Earlier this year, the Labour Party's governing coalition suggested it would allow police officers to wear headscarves with their uniform, in the hope that it would attract more Muslim women to the police force. But after widespread criticism of the proposal, the government dropped the idea. On International Women's Day in March, Syrian-born Sara Azmeh Rasmussen protested against headscarves by burning hers in public in the capital, Oslo. Ms Jensen's Progress Party has produced a list of special measures it says Muslims have requested to accommodate their religious sensitivities and traditions. On top of changes to the police uniform, the list mentions prison inmates wanting Halal food, and parents of teenage girls demanding that schools separate their daughters from boys during sports lessons. Most of her supporters say it is her hardline stand against Islamic values and rules that make her their favourite candidate. Some polls suggest that Ms Jensen's party could win the election, and that she could become the country's next prime minister - though to do so she would have to secure the support of other parties like the Conservatives, the Liberals and Christian Democrats. The significant success of the Progress Party has forced the governing Labour Party to react. Earlier this year, the government tightened asylum rules despite earlier pledges not to do so. And last month, senior members of the Labour Party called for a fight against radical Islam in Norway. However, the former prime minister and Labour Party leader, Thorbjoern Jagland, called it an unnecessary fight that would only lead to confrontation. While he argued that it was empty rhetoric, saying there was no radical Islam in Norway, the Norwegian Police Security Service (PST) insists radical Islam does represent a threat. "In Norway, extreme Islamist activity is carried out by small groups. However, the international connections the persons in these groups represent, in addition to activities they carry out, are such in nature that they can also influence that national threat picture," it said in a recent report. While the debate is getting more heated, not all Muslims agree with Mr Mahmood. 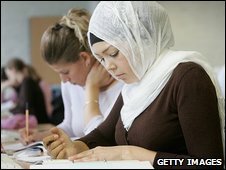 "Three to four articles critical of religion and the burning of a headscarf is not persecution of Muslims; it is a process of modernising," says Shakil Rehman, another Labour Party member. "Criticism isn't a smear campaign, but necessary progress."